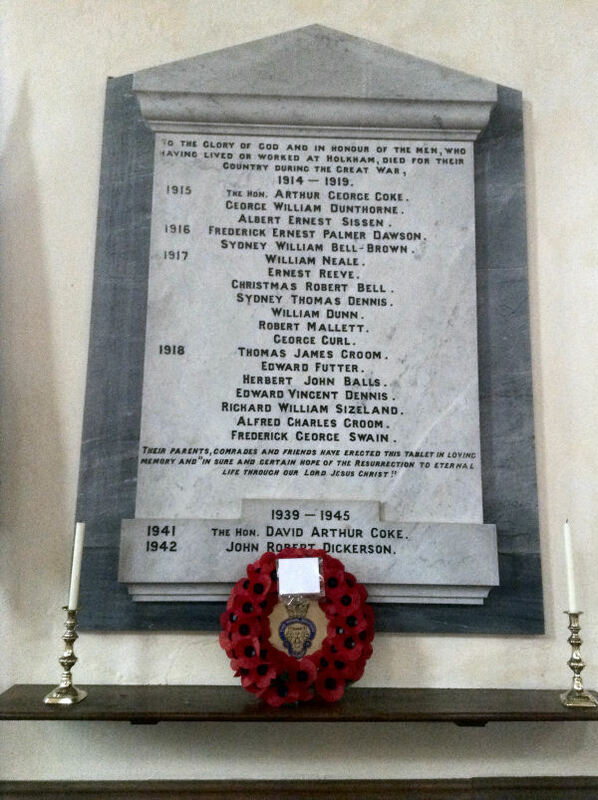 The memorial is to be found in St Withburga Church located in Holkham Hall Park, Holkham, Norfolk. It takes the form of a stone tablet with triangular pediment mounted onto a grey marble base with an additional piece placed at the base of the tablet for the World War 2 names. The inscription and names are in black lettering. The names are listed by year but have been sorted into alphabetical order within conflict here for ease of reading and research. Lieutenant. Armoured Car Division, Royal Naval Volunteer Reserve. Died at Sedel Bahr, Gallipoli, Friday 21 May 1915. No known grave. Commemorated on HELLES MEMORIAL, Turkey. Panel 8 to 15. See also Holkham and Flaunden, Hertfordshire memorial.